Prepared fresh for each order. Desired pH should be specified when ordering. To maintain constant pH during the time of the fixation. The pH of the fixative in EM is adjusted using the buffer system chosen; e.g. range 6.5-8.0. The ionic constitution to prevent the extraction of cellular components, or the deposition of precipitates of fixative chemicals. Buffer for diluting your primary and secondary antibodies, especially if stored for extended time, even at -20°C in glycerol, or refrigerator. Nonspecific binding of the antibodies, negative effects of disturbing substances and low or medium affinity cross-reactivities of the antibodies will be minimized, making your result more reliable. Excellent for IHC (frozen and formalin sections), flow cytometry on fixed cells, Western Blot and other immune assays. When used in pathology, in also greatly reduces non-specific reactivity of human serum components and immunoglobulins in tissue, vessels and cells with mouse antibodies used on section. For especially "trouble"-giving antibodies, as well as for in situ PCR applications, this dilutent may also be used as a washing buffer, preventing secondary binding of your analystes during washing. This ready-to-use Antibody Dilution Buffer is designed for the dilution of antibodies in all immunoassays, including immunofluorescence, IHC, ELISA, WB. This buffer contains immunoglobulin free BSA and does not contain phosphate, sodium azide, or mercury preservatives. It can be used for the dilution of all antibodies, including peroxidase, and antibodies to phophoproteins. However, it is not suitable for dilution of antibodies to S100 proteins. This buffer contains green food color. Application: Dilute antibodies, primary or secondary as recommended in the protocol by the manufacturer of these products. Storage: 2-8°C. Diluted antibodies can be stored at 2-8°C for several weeks, depending upon the stability of antibodies. Reagent: 10x, pH 6 antigen retriever solution. 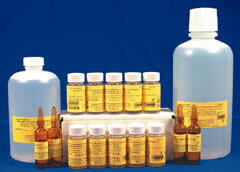 Reagent: 10x, pH 8.5 antigen retriever solution. Please see listing in Chemicals for Microscopy. The pH of this buffer is 7.4 (0.1M); the osmolarity is 440 mosmols, so this buffer is hypertonic to most body fluids. Millonig recommended to use this buffer for the fixation of very hydrated tissues with osmium tetroxide. For marine organisms, a higher concentration of sodium chloride (3%) is recommended. We supply it in a double strength (0.2M), pH 7.4. Dilution is needed before use. EMS is proud to announce and release of our newest Buffer for EM PHEM. PHEM buffer has been used primarily for tissues and cell cultures being processed for immunocytochemical studies. Most antigens, especially intra cellular ones, stain better using PHEM than those processed using PBS, it also has a more limited effect on biochemical reactions and enzymes. Very good preservation of cellular ultrastructure, notably microtubules, is also an advantage of PHEM use. Schliwa, Manfred, and Jonathan Van Blerkom. "Structural interaction of cytoskeletal components." The Journal of Cell Biology 90.1 (1981): 222-235. Prepared from Sodium Phosphate Monobasic Hydrate and Sodium Phosphate Dibasic Heptahydrate. Non-Sterile. Meant for research purposes only. *Meant for biological research only. Not to be used for medical or any other purposes. Aqueous PIPES solution adjusted by 0.1N Sodium Hydroxide to pH 5.5-6.0. The preparation is stable for 1 year when stored unopened at +40C. Every lot is issued with a certificate indicating the expiry date. After opening, store at +40C in the refrigerator and use within 6 months. A new class of blocking solutions based on chemically modified and fragmented ultra-pure casein. Effectively reduces unwanted binding of primary antibody and conjugates you use to charged surface of the slide and tissue section. Greatly reduces non-specific binding while preserving the specific reaction, by saturating potential non-specific protein-protein interactions. Moreover, in contrast to BSA-based, IgGm casein or serum-based blocking solutions there is no interaction of specific antibody and blocking protein itself. or oth Is not comparable to other commercially available or home-made blocking solutions. Recommended for research and diagnostic pathology, especially for retrieved sections and polyclonal antibodies. The osmolarity of a 0.1 M at a pH 7.2 is 226 mosmols; with the addition of 0.18 M of sucrose to the solution, the osmolarity raises to 425 mosmols. Standard pH 7.2; 0.2M is supplied. Otherwise, specify pH when ordering. Bennett & Luft., Biophys & Biochem. Cytol., 6,113 (1959). A very stable buffer, used with Osmium tetroxide; provides excellent fixation, better stability and buffering capacity. The pH can be adjusted by varying the amount of hydrochloric acid in the final volume of 200 ml. Preparation Instructions: Pour 9ml of 2N HCl; add 5.34ml of Sym-Collidine, mix well and add distilled water up to 200 ml for a pH 7.4 solution. Immunoassay buffer is used as a 1x in all immunoassays (immunofluorescence, IHC, ELISA, WB etc.) as a washing buffer and it can be used as a dilution buffer for antibodies; however it does not contain any carrier proteins. This buffer also does not contain any phosphate, sodium azide or mercury as preservatives and can be used for dilution of all antibodies, including peroxidase, antibodies to phosphoproteins. It is not suitable for dilution of antibodies to S100 proteins. Application: Dilute this 10x buffer 10 times with DI water. (90 ml water + 10 ml this buffer – mixed well). Wash 3-5 times with this buffer in between the steps of your immunoassay protocol. This ready-to-use Universal Antibody Dilution Buffer is designed for dilution of antibodies in all immunoassays, including immunofluorescence, IHC, ELISA, WB. This buffer does not contain any mammalian proteins, phosphate, sodium azide, or mercury preservatives and can be used for dilution of all antibodies, including peroxidase, and antibodies to phophoproteins. However, it is not suitable for dilution of antibodies to S100 proteins. Storage: 2–8°C. Diluted antibodies can be stored at 2–8°C for several weeks, depending upon the stability of antibodies.